Though they look pretty damn real. Except for the unhuman sizes for many of them. I'm not sure how I really feel about this kind of art, it reminds too much of "photo realism", which, while it takes talent, doesn't indicate true genius (and is unnecessary; just take a freaking photograph). Picasso, now there was an artistic genius, and the works he's most famous for are anything but an exact copy of reality. 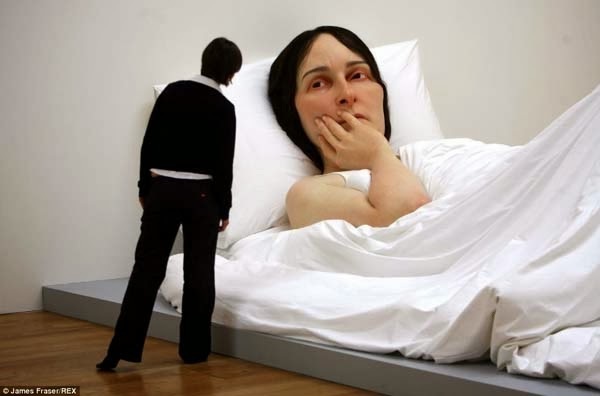 Still, you can gaze with amazement at the work of Ron Mueck, former model maker and puppeteer (he worked on the excellent film Labyrinth, which proves, maybe, that he's more a craftsman than an artist). In any event, he's no Picasso.